Going to Orfeo ed Euridice last night at the Met was by last minute arrangement of Little Love (of course!). It was an especially special treat as we sat in Center Parterre seats. These ain't the cheap seats for sure. It was extra cool to be seated semi-privately in a little box for a change. I was interested in seeing this production - Mark Morris directed and choreographed it. Known for his modern dance group, I was interested to see what he would do here even while I'm not much of a modern dance fan. I felt it was heavy on dance, but it worked in a very theatrical way. It's a Gluck opera, so while the music is gorgeous, there's not much action you can put in anyway. It's by no means grand opera, so Mark found humor in the text by choreography and Isaac Mizrahi's unusual costuming of the Met chorus. The Met Chorus, acting as the dead of the underworld, were costumed as historical figures of the past. 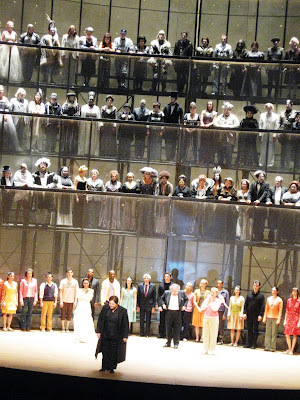 I loved trying to pick out all of the characters - I think there were around 80 of them, all positioned on three tiers above the stage for the entire opera. My favorite were Abe Lincoln, Princess Diana, Babe Ruth, Elizabeth the 1st and Eva Peron. It was fun to see all of these figures side by side regardless of their place and time in history. There wasn't anything obviously funny about their presence; they just added fun to the atmosphere. The dancers changed costumes three different times, not in style but in colors. They were dressed somberly then at the end in a celebratory way, as their very plain street clothes were bedazzled. I couldn't help but love them. The dance changed that way as well. I actually loved it and nobody looked like they were having a seizure and all of them wore shoes. 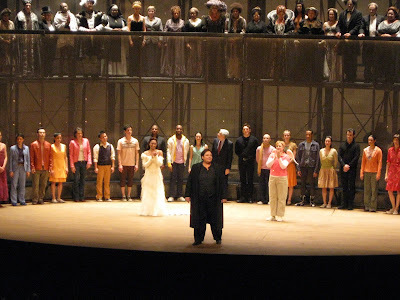 I loved Stephanie Blythe's voice as compared to what would normally be heard from a countertenor in the role of Orfeo. The mezzo soprano voice as compared to the countertenor is just a more beautiful sound to my ears. She was sort of Johnny Cash dressed all in black with a guitar strapped to her back. She played the tormented lover just right. Heidi Grant Murphy (Hooray! We saw her sing Greenfinch and Linnet Bird at Wall to Wall Sondheim) as the cherubic Jove, dressed in a sparkly pink golf shirt, brought humor to the night. Her voice was bright and pretty. Danielle de Niese as Euridice was a beautiful bride with a stunning voice. It's a very pretty opera and nobody dies; well, Euridice dies twice, but in the end she lives when love conquers all. There are three more opportunities to see this production, one being this Saturday afternoon both in the house and broadcast live in HD in movie theatres around the world.